An investigative report: What’s life like for a Year 7 at Blue Coat? Well, I managed to down half a cup of coffee before it was time to head off to the Lower School Common Room to meet up with Patrick. Some would describe the LSCR as vibrant – perhaps noisy would be more apt. That said, everyone was chatting and, even those on their mobile devices were interacting simultaneously. The boys, however, were quick to put away their phones when instructed by Mrs Dance. Some boys were loitering outside, enjoying the glorious sunshine and some were undoubtedly out on the back field playing football. Patrick was not to be seen but I eventually hunted him down in the reading room in the Library. I’d like to say he was deeply engrossed in a book……..
We headed off to tutor period as soon as the bell rang. We waited outside the tutor room and were greeted by the effusive Mrs Oliver: “Good morning, my lovelies”. Ollie-Bob was quick to ask me whether I would be stalking Patrick all day! If you were expecting boys sitting in rows, answering the roll call, you would be way off the mark. 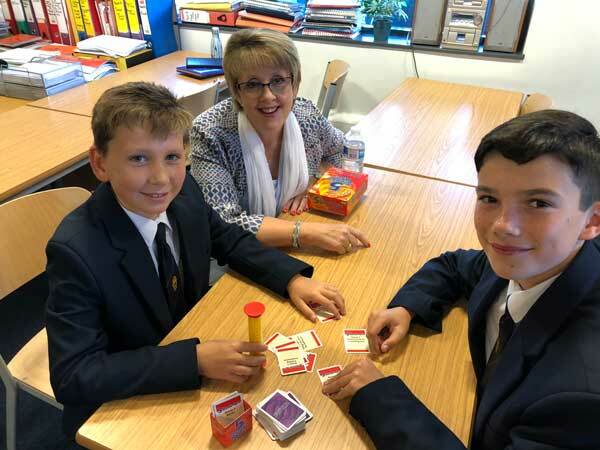 The boys all selected something from the games box and then settled down in small groups to play Top Trumps, Chess, Connect 4, Chess and Dobble. Twenty minutes of traditional fun with not a phone in sight! As we packed up, Mrs Oliver asked what our first lesson was to be. “PE, Miss”. The boys laughed; my face said it all. I suddenly realised what Mrs W’s comment on Facebook was really about. 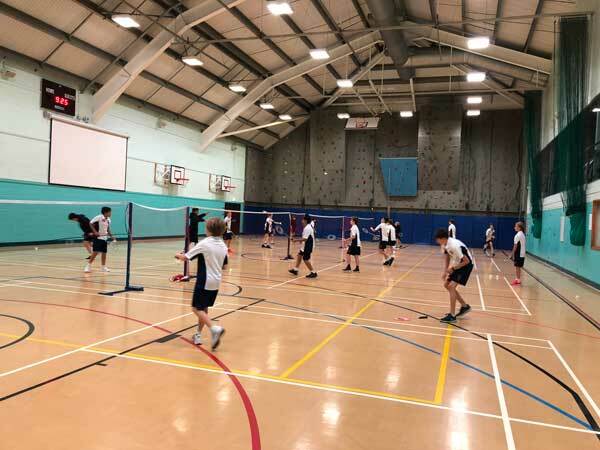 I met up with the boys again in the Sports Hall: badminton, phew! Oh, my, how things have changed! In my day, we were given a badminton racquet and a shuttlecock and left to get on with it. Today’s lesson with Mr Dance was very different. The boys started off by learning about technique before heading off to the nets. For the remainder of the double lesson they were practising serves and playing against one another, interspersed with some great coaching. The progress that each boy made by the end of the lesson was impressive. Off the boys went to the changing room. I began to wonder if they were being dressed by mums and dads every morning because they were much smarter at the start of school than when they emerged from the changing room. Then it dawned on me: speed of changing was more important if they were to get a good place in the tuck shop queue. Oh, no the bell’s gone already and I need to get to C2 for English with Mr Morton! I’m late – Patrick has already logged on to his computer – how did he get there so quickly? The boys are working in groups and creating their own adventure books. The team work is impressive and the majority seemed to have achieved so much in a short, pacy 35-minute lesson. We’re off to French now. While we queued up outside the classroom, discussion continued about the queues at the tuck shop and the “annoying Year 9s”. I promised to mention this to the Headmaster. Anoop politely asked me why I was doing this – so I explained. He couldn’t believe that my sons had never heard of smartphones when they joined the school! In French, Patrick and his peers were learning about the months of the year… quelle est la date de ton anniversaire? There goes the bell again. We have to get from the RAB and over to Mr Mellows’ Science classroom upstairs in the Science block. I’ve chosen a seat at the back and am relieved to report there are no signs of any reptiles in here. Thank goodness we are not in Mr Colville’s classroom! We’ve had a quick bit of revision in scientific terms and now we’re moving on to chromatography! My concentration is waning, I’m hungry. Not long until lunchtime! As we headed out of Science, I was mightily relieved it was lunchtime. But, no, Patrick informed me Year 7 have lunch at 1:30pm on a Tuesday. Would I last? We headed back to the Common Room to drop our bags off. Patrick said he was going to head off for a spot of ‘it’ before lunch so I took the opportunity to go back to the office to tell my colleagues about my morning, then headed back to the Dining Hall at 1:30pm. No sign of Patrick, but I could wait no longer, so I filled my plate with a healthy portion of salad and resisted the pancakes in favour of some fresh fruit, and sat with Alex, Eddie and Leon, who told me about the differences between Blue Coat and their prep schools. All agreed that they don’t much care for homework, although Eddie conceded that homework at Blue Coat was more interesting than in his previous school. Eddie and Leon, who both tucked into a plate of cottage pie with green beans, cleared their plates. Patrick joined us a little while later, with a healthy-sized portion of pasta and pancakes, which was polished off very swiftly. Our Assistant Bursar will be pleased to hear there was absolutely no waste; in fact, we should count ourselves fortunate that the glaze remained on the bowls! As it turned out, Patrick was late as he’d decided to play a spot of House Chess – and he won his match for Rich! Luke and Aman joined the group and we had a good chat about Premier League football. Luke is convinced Mourinho will be gone by Christmas and he is unlikely to secure another position with a UK club – let’s wait and see. Carbo-loaded, Patrick is now off to play football, while I head back to the office, to have a rest. I arrived in tutor, late! Ethan had taken centre stage this time. He was telling a gruesome story about some poor chap who survived despite every disaster you could possibly imagine. His illustrations on the board were quite graphic but it seemed to appeal to the boys! Ollie-Bob has retrieved his shoes from lost property but has now lost his bag. Mrs Oliver has suggested she wraps him in Velcro and sticks all his possessions to him! 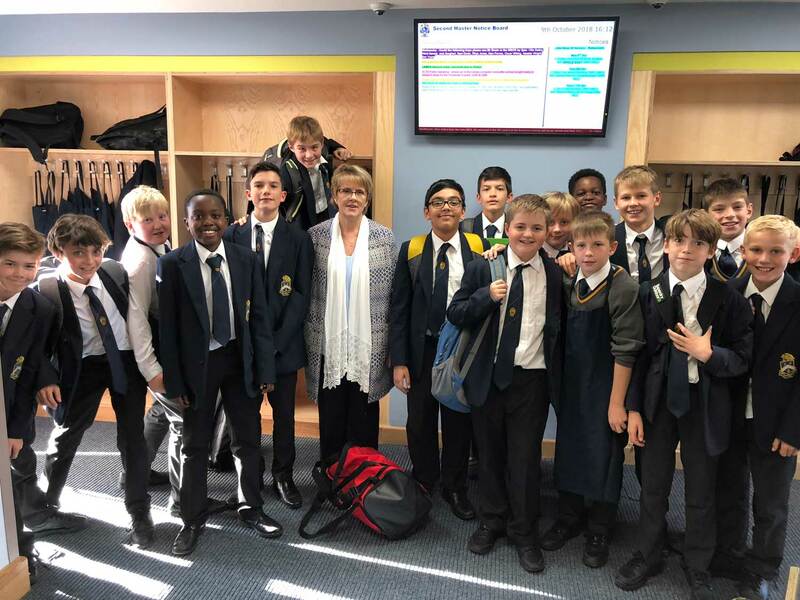 The bell went at 2:20 and we headed across the corridor to RS with Mrs Kelly, who encouraged some really great discussions about evolution. I was really impressed with the boys’ curiosity. They had definitely been thinking about what they had learned and were challenging some of the theories. I have a sneaky suspicion that, as Mrs Kelly was standing in for Dr Magill today, one or two boys might have been trying to catch her out. A foolish move, as her extensive knowledge was no match for any of them! I’d really like to come back and learn a bit more. One hour and ten minutes before the final bell, we headed off to Design Technology. I have been in this new building several times with prospective families but my visits have been fleeting. I was quite excited as a full-on DT lesson would be a genuine first for me. 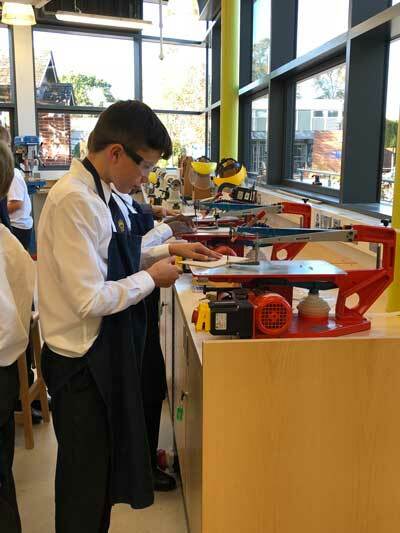 The boys hung up their bags, donned their aprons and then we settled down in the wood workshop while the kindly Mrs McGough returned homework and set the next lot – no sense doing this at the end of the lesson when boys are dashing off to after-school activities or to catch buses home. In the previous lesson, the boys had started work on making their toys; some were still finishing their designs on paper while others were pressing on with cutting out their templates in MDF (that’s medium density fibreboard to us newbies). Half way through the lesson, we were joined by Mr Robbins, our DT technician, who I think arrived at Blue Coat before broadband. I think he had a hand in the rather nice coffee table in my living room which one of my sons produced at GCSE. Mr Robbins quickly got stuck in to teaching Owen how to use a coping saw so he could cut out the windows on his toy car. It was evident that DT is one of Owen’s favourite subjects. I was impressed by how the boys conducted themselves in a workshop with so much potentially dangerous equipment. Obviously well-drilled (no pun intended) in all health and safety procedures. As the final bell approached, nobody was watching the clock – all totally engrossed in their projects. Ten past four, the end of lessons arrived and there was just time for a quick group photo, before the boys headed off to various activities or for their lifts home. The boys were quick to point out that, at age 11, Patrick is already taller than me! Patrick and I headed off to running club with Mr Cook, but sadly I forgot my trainers; perhaps they are with Ollie-Bob’s lost bag. Mr Cook met us out on the back lawn and I was overwhelmed by the number of teachers sorting out their teams for after-school training. Mr Dance still appeared to have as much energy as he did at 10 o’clock this morning – perhaps he had a very large breakfast! I bid farewell to Patrick and his buddies and left them to their running, scheduled for the next hour – yes, a whole hour! I have returned to my office, determined to drink a full cup of coffee as I ponder about my day. So what’s it really been like? There have been times during the day when the boys did not always seem to be listening but then when asked questions about what they had been learning, they were able to give textbook answers. There has been no showing off in front of me; the boys have just got on with their normal day as if I was with them every day. They have held doors open and been well mannered – without exception. It is true that the boys have the benefit of youth, and anything that is not part of your normal routine can be tiring. We have all experienced going to a conference, and sitting about all day, listening, and still feeling exhausted at the end – well, that’s me today. Teaching has definitely changed since I was in school but I am pleased to report that everything I tell prospective families about Blue Coat is true. 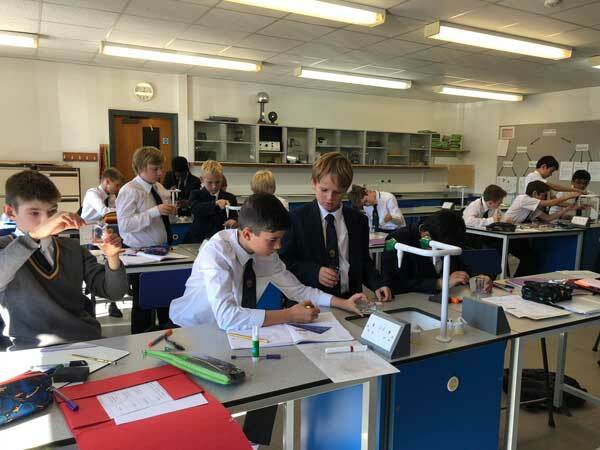 We have a very pacy curriculum which keeps the boys busy and engaged but we are all fortunate to work and learn in a really friendly community, with teachers who are passionate about their subjects and their students. Patrick was great company and, when we chatted between lessons, he spoke with much enthusiasm about all that he was doing, a real gentleman. Just before running club, Tom asked me to say ‘he is awesome’; well, yes, he is, but then all of the boys (and teachers) I have been fortunate enough to spend time with today are, too. Oh, look, I did have my trainers with me after all!